The first 747-8 freighter is due to be delivered in late 2010, with the passenger model currently scheduled for 2011. Boeing announced that it was launching the 747 Advanced as the "Boeing 747-8" on 14 November 2005. The 747-8 and 747SP are the only 747 variants with a fuselage of modified length. This will be the first lengthened 747 to go in to production. The 747-8 will use the same engine and cockpit technology as the 787. Boeing says that the new design will be quieter, more economical, and more environmentally friendly than previous versions of the 747. As a derivative of the already common 747-400, the 747-8 has the economic benefit of similar training and interchangeable parts. The 747-8, as the current new development of Boeing's largest airliner, is notably in direct competition on long-haul routes with the A380, a full-length double-deck aircraft now in service. For airlines seeking very large passenger airliners, the two have been pitched as competitors on various occasions. Production of the first 747-8 Freighter began in Everett in early August 2008. On 14 November 2008, Boeing announced a delay to the 747-8 program, citing limited availability of engineering resources within Boeing, design changes and the recent strike by factory workers. Delivery of the first 747-8 Freighter was rescheduled from late 2009 to the third quarter of 2010. The first 747-8 Intercontinental passenger jet delivery was rescheduled from late 2010 to the second quarter of 2011. The 747-8 is a development of the Boeing 747, which takes advantage of improvements in technology and aerodynamics. The two variants of the 747-8 were launched in 2005, and as of 2006 will both feature a fuselage stretch of 18.3 ft (5.6 m) over the 747-400, bringing the total length to 250 ft 2½ in (76.26 m). The stretch would mean that the 747-8 would be the world's longest passenger airliner, surpassing the Airbus A340-600 by 3.6 ft (1.1 m). Compared to the 747-400, the main technical changes will be on the wing of the aircraft, which will undergo a complete design overhaul. The sweep and basic structure will be kept to contain costs, but the wing will be thicker and deeper, with the aerodynamics recalculated. The pressure distribution and bending moments will be different, with the new wing for the passenger version being planned to hold 64,225 US gal (243,120 l) of jet fuel, and the cargo aircraft 60,925 US gal (230,630 l). The new wing will have single-slotted outboard flaps and double-slotted inboard flaps. Raked wingtips, similar to the ones currently on the 777-200LR, 777-300ER, and 767-400ER models and the 787-8 and 787-9 design, will replace the winglets on the 747-400. These structures help reduce the wingtip vortices at the lateral edges of the wings, decreasing wake turbulence and drag and thereby increasing fuel efficiency. The extra fuel capacity in the redesigned wing compared to the 747-400 obviates the need to radically change the horizontal tail unit to accommodate auxiliary tanks, further saving costs. Nonetheless, the vertical tail unit will be raised slightly to 64 feet 2 inches (19.6 m) on the 747-8. Some carbon fiber reinforced plastic will be utilized in the 747-8's airframe to reduce weight; however, structural changes will mostly be evolutionary rather than revolutionary with respect to the 747-400. The General Electric GEnx, which is one of the two powerplant choices currently offered for the 787, will be the only engine available for the 747-8. However, the 747 variant will be adapted to provide bleed air for conventional aircraft systems and feature a smaller diameter to fit on the 747 wing. An exclusivity agreement between GE and Boeing means that no other manufacturer's engine can be fitted to the 747-8 within at least 10 years. 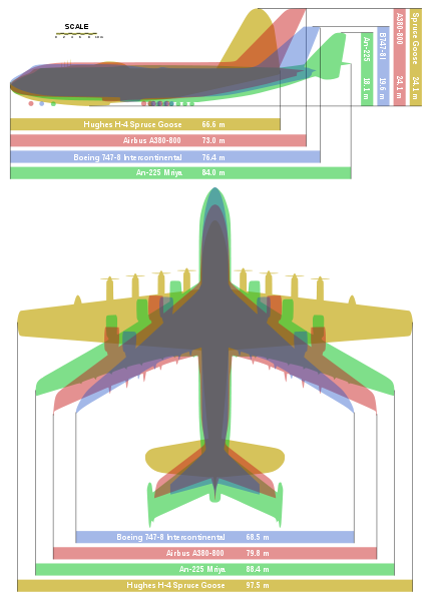 Size of the Boeing 747-8 compared to the Airbus A380 and AN-225.